I feel like this week is like the movie Groundhog Day for my blog. Because last week I posted recipes involving sweet potatoes and candy canes. And this week? More sweet potatoes and more candy canes. I was going to save this Chewy Chocolate Candy Cane cookies recipe for next week, but I want to post it in time for holiday baking. Because it’s really good! I am not a crispy cookie person. For me, it’s all about the chewiness. And these cookies are the easiest, chewiest, yummiest cookies I make. The basic chocolate cookie is one of my go-to recipes (yup, it’s the one I used in my Chocolate Peppermint Cookie Ice Cream Sandwiches) and I add whatever I have on hand to finish them. Toffee pieces, peanut butter chips, dried cherries, chopped nuts–they’re all great in these cookies. So since it’s Christmas cookie season, I decided to try adding broken candy cane pieces. 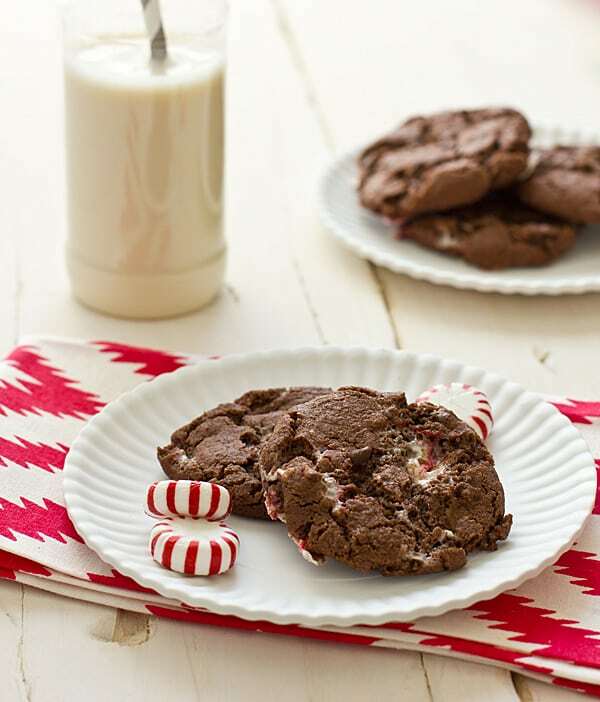 They’re not the prettiest cookie, it’s true, but they make up for it in taste–chewy chocolatey cookies dotted with crispy bits of peppermint. Do you have a favorite recipe for holiday cookies? I would love to hear about it! Chewy chocolatey cookies studded with bits of broken candy canes and chocolate chips. Combine flour, cocoa, baking powder, baking soda, and salt in a small bowl and whisk until combined and any lumps are broken up. In a large bowl, beat butter and sugar together using a mixer on high speed. Add vanilla and egg and beat until combined. Set mixer to low speed and slowly add flour mixture. Beat until just combined and fold in chocolate chips and peppermint pieces. Drop tablespoons of batter two inches apart onto a baking sheet coated with cooking spray. Bake for 12 minutes or until set. (Don’t overbake or the cookies won’t be chewy!) Cook on baking sheets for 5 minutes, then finish cooling on wire racks. Vegetarian Chicken Noodle Soup What I Ate This Week | Making ingredients go further. Those are my thing. I am nuts over peppermint and chocolate together! I’m making little chocolate peppermint cakes this weekend–if they turn out well, I’m going to post them next week. 🙂 I hate to keep repeating myself with the chocolate and candy canes, but I have lots of candy canes to use! I’m on a chocolate kick lately. I think it’s about over, but then again I’m debating on making my smores tonight. Ugh… where is this sweet tooth coming from!?!? Oh man, I really want one of these. Like right now. Yum. Oh my goodness those sound amazing! I’m not big on eating candy canes by themselves but love the taste of mint in things! I’m drooling over your pic too! Fantastic! You had me at chewy. Definitely making these as soon as I can. Peppermint Bark is my favorite holiday treat! In a cookie, I think I’d be weak in the knees! 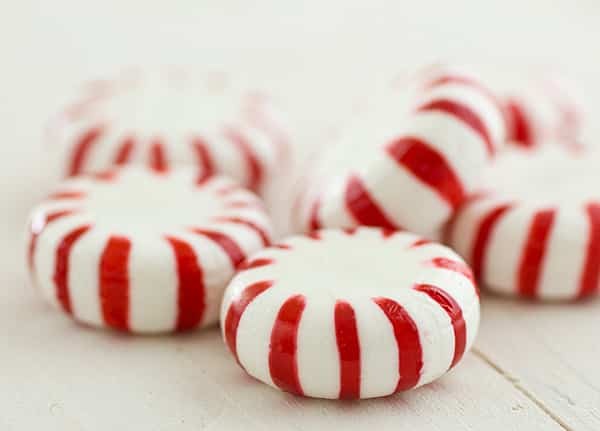 You know my “soft” spot….peppermint! Wow these sound really yummy! What gorgeous pics you took of the food. Looks insanely delicious! Those look so amazing! I really think they should sell candy canes year round! Pinned this- they look AMAZING! I absolutely adore peppermint! That looks good! I think I have all the ingredients too! Aw shucks, I don’t have the mini chocolate chips. I can’t keep those on hand since I would be snacking on them. lol I might have to make a trip to the store before I start making cookies! Candy cane….something you must have during the holiday! These cookies look wonderful! They definitely shouldn’t have been crunchy–I’m guessing that the increased sugar content from the sweetened cocoa caused that. (Or maybe they were over-baked?) If you make them with sweetened cocoa again, definitely add less sugar! My cookies came out as one, big, melted and burnt cookie! I followed the recipe exactly, except that I replaced the egg with 1 tbsp of flaxseed with 3 tbsp of water (which I usually do for any recipes calling for 1 egg. I have never had a problem before.) I’m not sure if this was the problem or not. They melted together in the first 5 minutes of baking (I noticed this with the 2nd batch). The baking soda and powder were not expired either. Any ideas as to what may have gone wrong? Thanks for this recipe! I have to say I chose a bad day to do it as I just ran out of eggs but we just had to try it. I noticed the comment about the flaxseed replacement so I tried the 1/4C vegetable oil substitute. The batter was sandy and not thick however I was able to form them into balls. They taste yummy but they are very soft and delicate. It’s a nice treat! I can’t wait until I have eggs to try it again.